As usual, Kathleen has packed lots of events into the month. On August 5th the amazing duo of Andrei and Jannie Burdeti will perform at both buildings (check below for the time). Classically trained, their music is a balm to the soul. The grocery shuttles this month are on the 7th and 30th. Kathleen will leave at 1pm for both trips with stops at Thrifty Foods and Save on Foods, then bring you back home. Chris Mundigler talk will be the conclusion to “A Day on an Archeological Dig” on the 9th. (then he is off on expedition until October, when he will return for his very popular lectures). On the 16th Chef will be BBQing ribs and hamburgers for our Country and Western night. Come dressed in your best country and western attire. There is a prize for the best cowboy and or cowgirl! And hang around after dinner for the entertainment by The Country Duo at Norgarden and Tom Gough at The Peninsula! The Men’s club is taking a break for the summer, however JOY rocks on! This month the Ladies Club will head to Bill Mattick’s Restaurant at Mattick’s farm for lunch. the bus leave at 11am, please be in the lobby by 1045. 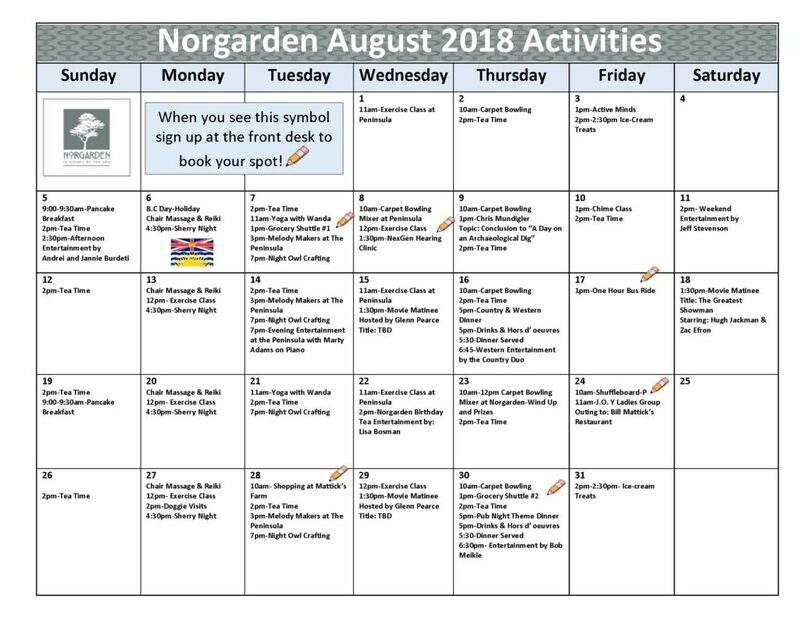 August 30th sees our second theme dinner with Pub Night. Chef will be cooking strip loin steaks, French fries, scallop salad, and that is just the beginning of the menu for this dinner. 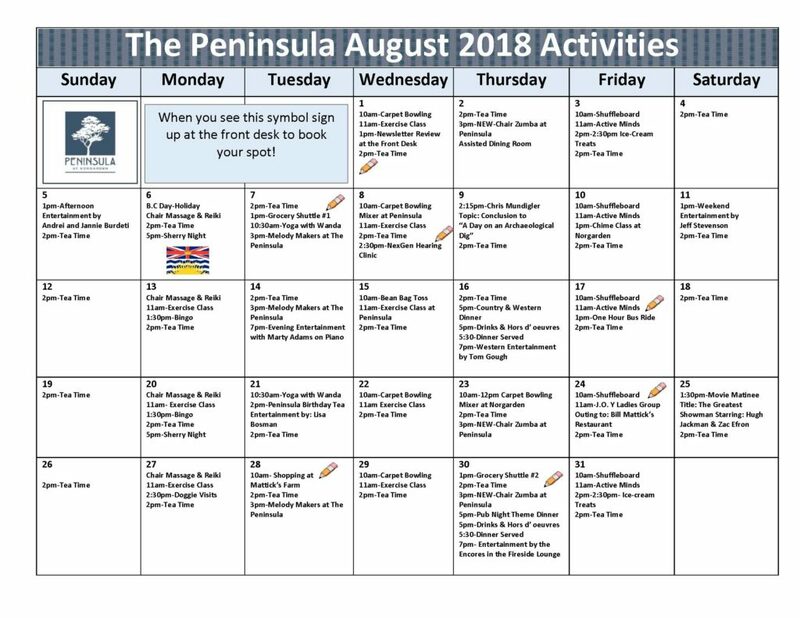 Please see below for all the activities for August.